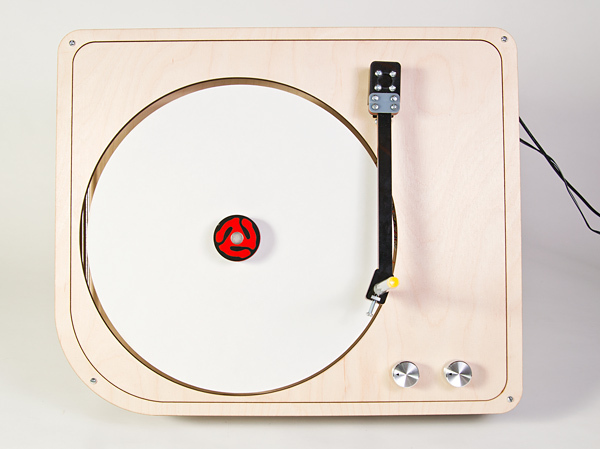 The Turndrawble is a turntable that creates drawings instead of sounds. 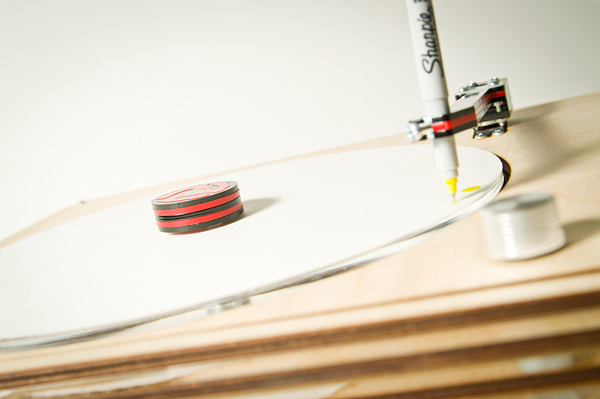 You can control the speed of platter rotation and the angle of the arm. 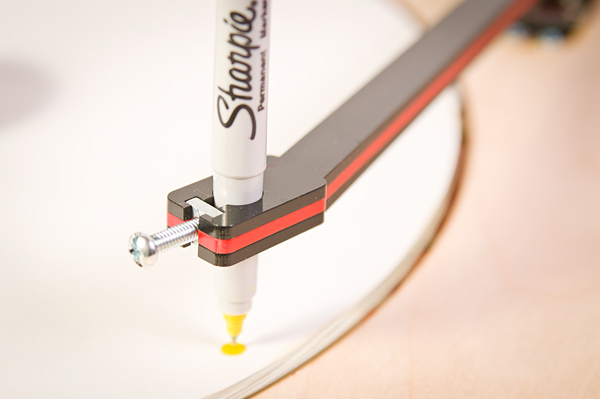 The arm holds Ultra Fine Point Sharpie Markers and it draws on 12″ diameter circular pieces of paper. The Turndrawble as a device was first imagined around 2012 but the first iteration was built as a final project for a class at UWM’s Peck School of the Arts taught by Frankie Flood titled “Machines that Make” which focused on using rapid prototyping machines to make rapid prototyping machines. Basically we had to make a machine that could make a thing. The Turndrawble makes drawings. The Turndrawble consists of many laser-cut parts. There are no 3D printed parts, as I wanted to avoid mixing the two technologies. This made a few things difficult, but I think it was the right decision. 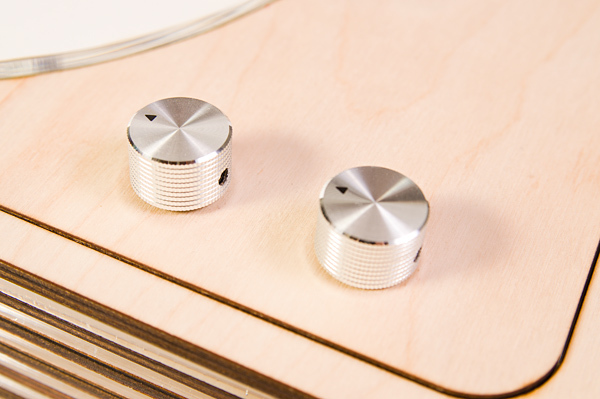 The materials are 1/4″ Baltic Birch plywood and 1/4″ clear acrylic, along with some 1/8″ colored acrylic. In creating this piece I thought about how turntables were once these beautiful objects that played music in our homes. Over the years as technology changed, they got phased out, tossed out, and relegated to the status of “hipster nonsense” in favor of digital music libraries with no physicality. This is my attempt to bring back the turntable. 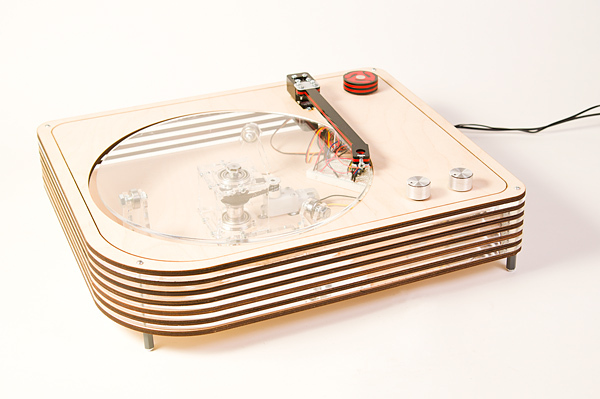 I chose not to just hack an old turntable into the Turndrawble. 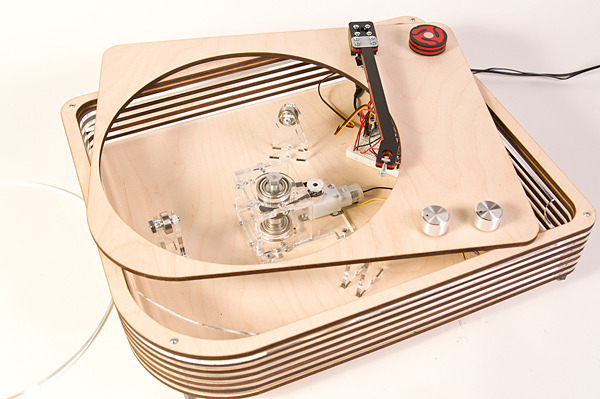 I wanted to go through the process of designing a turntable. I’m a fan of the iterative process of design using digital fabrication—of making a part, testing it out, finding ways to improve it, and then making it again—and learning along the way. In showing the Turndrawble to people, I see a divide between those who remember and have a fondness for turntables, and those who do not. 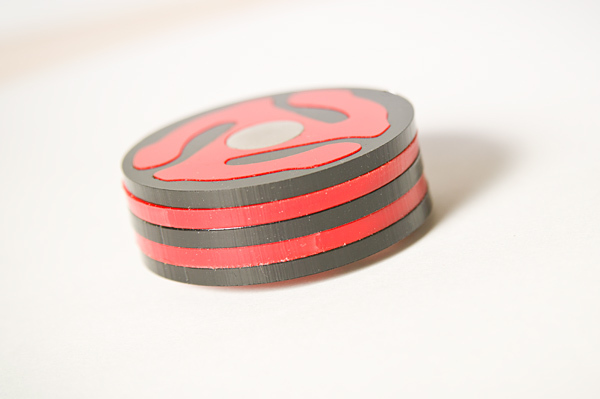 Some people see the center piece that holds down the paper and immediately recognize the reference to a spindle adapter, while others have no idea what that piece is, or why it looks like that. One of the goals of the Turndrawble is to let people use it and take away a drawing, as a gift from me. The Turndrawble invites you to be not just a spectator in the creation of art, but a participant. I remember that excitement of buying a vinyl record, and the anticipation of getting home and putting it on the turntable to experience it. I don’t know if people will have quite the same excitement in creating a piece of art and taking it home, but I hope they remember the experience of creating a unique drawing. Dropping the needle has been replaced with dropping the pen, and the act of consuming has been replaced with the act of creating.